Glengoyne’s classic single malt, but strong enough to curl your kilt. Originally called “Burnfoot Distillery,” George Connell officially started Glengoyne in 1833 — after the Excise Tax Law of 1823 made it cost effective to do so. The fact that good old George had been hauling full casks of Whisky out of the tree-lined glen since 1820 is purely a coincidence. Anyway, the point is that they have been making single malt Whisky here for a long time. Famously, they say the Glengoyne distilling process takes longer than any other in Scotland in order to deliver their unique richness and character. To understand the signature Glengoyne style you need to know three things. First, the malt is indirectly dried with warm air (no peat or coils). Second, they make extensive use of Sherry casks for aging across the entire core range. Third, they exclusively use “Golden Promise” barley — which has a lower grain yield, but higher quality. Only two distilleries use this rare and expensive grain — the other is The Macallan. 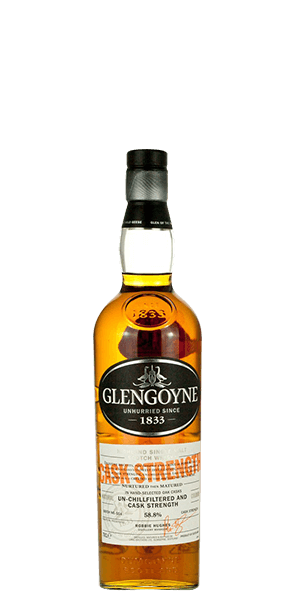 Glengoyne Cask Strength delivers this sensuous, signature style at a jaw-dropping 58.8% ABV. No wonder it brought back the Gold medal from the International Spirits Challenge. The boundary between the Highlands and the Lowlands — called “The Highland Line” — runs right through the distillery grounds just outside Glasgow. This means that the still-house sits officially in the Highlands, while the aging warehouse sits officially in the Lowlands. What does Glengoyne Cask Strength Batch 4 taste like? The Flavor Spiral™ shows the most common flavors that you'll taste in Glengoyne Cask Strength Batch 4 and gives you a chance to have a taste of it before actually tasting it. Shortbread biscuits, strawberry jam, hot cream. Rich and lightly sweet with sugar cookies, elderberry wine, and a dash of pepper. Biscuit, sherry bomb, spicy, black pepper, bitter, grain, strawberry, sugar, jam. A little too strong for my taste, but has a nice sherry touch that's pleasant on the nose and palate. A good strong taste. The ‘afterburn’ is strong with this one. I really like it for those cold evenings - has a good spicy taste! Would definately recommend this to friends. Really smooth but had a nice bite to it with your first taste, a nice after taste left.